CGPSC For Librarian And Others Post Govt Job 2019 Syllabus Check Here. CGPSC Notification is out. 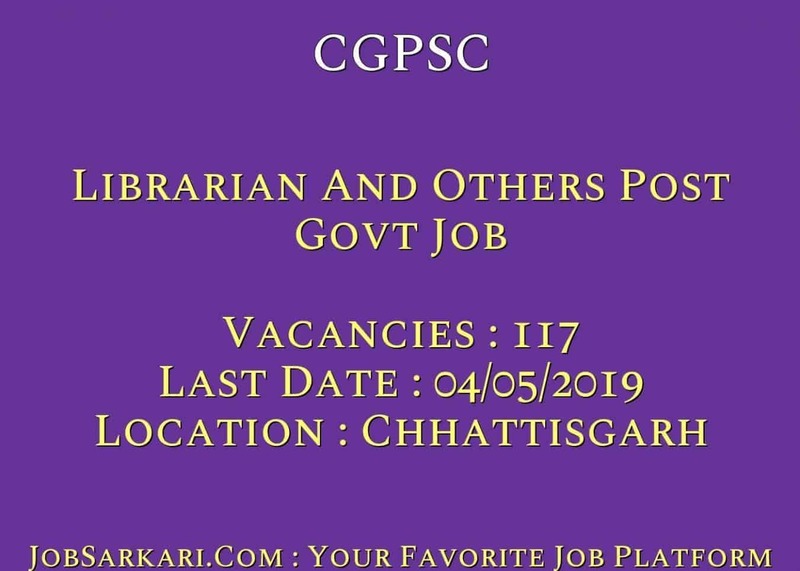 CGPSC is recruiting for 117 Librarian And Others Post Govt Job Posts. You can check CGPSC - Chhattisgarh Public Service Commission last date, download CGPSC notification, visit CGPSC official website and check other CGPSC Vacancy details.Complete Vacancy and recruitment Details about 117 Librarian And Others Post Govt Job vacancies in CGPSC are provided below by JobSarkari.Com only for you. Last Date of Apply Online. 04/05/2019. Last Date of Pay Fee. 04/05/2019. Date of Form Correction. 07/05/2019 to 13/05/2019. Mode of Payment. Candidate Can Pay Application Fee Through Debit, Credit Card And Net Banking Or Through E Challan. Librarian (Regular). 11. 03. 03. 08. 25. Librarian (Backlog). 00. 04. 04. 23. 31. Sports Officer. 17. 05. 05. 13. 40. Sports Officer (Backlog). 00. 00. 10. 11. 21. Total Vacancy. 28. 12. 22. 55. 117. Candidate Must Have Passed Post Graduation in Library Science/ Info Science/ Documentation Science With 55% Marks. Maximum Age For Other State Candidates. 30 Years. Maximum Age For Chhasttisgarh Candidates. 40 Years. Age Relaxations. As Per Govt Rules. Running. Male. 1800 Mtr Running in 12 Mins. 1500 Mtr Running in 12 Mins. 1200 Mtr Running in 12 Mins. 800 Mtr Running in 12 Mins. Running. Female 1000 Mtr Running in 12 Mins. 800 Mtr Running in 12 Mins. 600 Mtr Running in 12 Mins. 400 Mtr Running in 12 Mins. 9. Online Applications Can be Submitted on Or Before 04th May 2019. Q. What is the Last Date For CGPSC Librarian And Others Post Govt Job Vacancy ? A. 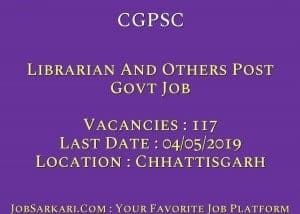 Last Date for CGPSC Librarian And Others Post Govt Job Posts is 04/05/2019. Q. What is the Form Type of CGPSC Librarian And Others Post Govt Job Recruitment ? A. The Form Type for CGPSC Librarian And Others Post Govt Job Posts is Online. Q. How many vacancies are available in Chhattisgarh Public Service Commission Librarian And Others Post Govt Job Posts ? A. There are about 100 Vacancies in Chhattisgarh Public Service Commission Librarian And Others Post Govt Job Posts.